S-nitrosated oxy-hemoglobin is vasodilating without release of free NO (cf Fig. 7). 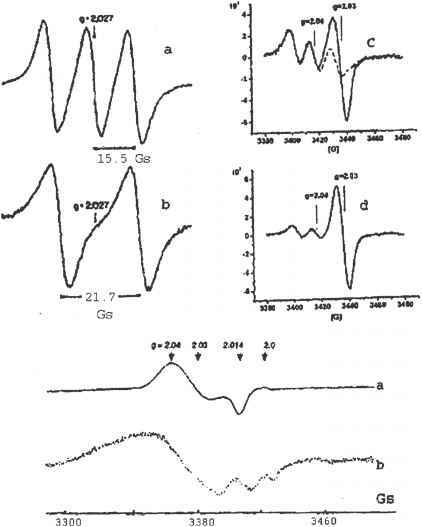 The sensitivity of aortic tissue to GSNO is very high, and of the same order of magnitude as the sensitivity to the physiological stimulant acetyl choline (Ach) (Fig. 8). The vasodilation of aortic rings is considerably reduced when superoxide levels in the organ bath are arti -cially raised by coincubation with pyrogallol , a generator of superoxide radicals. Seen as NO donors various RSNOs can produce both bene cial and adverse effects on cells and tissues. This state of affairs reminds us of the ongoing controversy surrounding the bene-ts/disadvantages of upregulation of NOS enzymes. Many detailed studies in vitro and in vivo suggest that raising levels of free NO be bene cial in vascular ischemia, but harmful in brain ischemia. Accordingly, many therapeutic treatments of ischemia involve NO donors for vas-culature, and NOS inhibitors for brain. Experiments con rm many similarities between the effect on ischemia of LMW S-nitrosothiols and true NO donors. The similarities include relaxation of blood vessels or bronchial smooth muscle, inhibition platelet aggregation, etc. Just as with true NO donors, high doses of RSNO can be harmful and activate the apop-totic chain [90 92]. The mechanism is still being investigated. A signi cant contribution is attributed to the oxidation of excess NO to the highly noxious peroxinitrite. The latter induces so-called nitrosative stress . In many cases, moderate doses of S-nitrosothiols are seen to provide protection against oxidative stress: Just like true NO donors, GSNO stimulated the recycling of ascorbate by human erythrocytes . The mechanism was not fully understood but did not signi cantly depend on the presence of free transition metal ions in solution. It is interesting to note that the iron status of cells is an important parameter in the response of cultured cells to exogenous RSNO. NO is implicated in the activation of the apoptotic chain. Details of this mechanism are discussed in Chapter 12. Interestingly, the apoptotic action of NO depends on the presence of iron. Cellular apoptosis could also be abrogated in a range of cultured human tumor cell lines by the addition of exogenous iron to the medium .